Obituary for Beverly A. (Baumann) Freeman | Sunset Options Funerals & Cremations Inc.
Beverly Ann Freeman, (Nee Baumann) 88, of Cudahy, passed away early Monday morning, March 11, 2019, at Zilber Hospice, Wauwatosa, WI. She was born October 23, 1930 in Redgranite, WI, the daughter of Harold and Ona (Pike) Baumann. She enjoyed reading, playing cards with friends, and watching and cheering on the Green Bay Packers while enjoying a gimlet. Bev’s most cherished memories were raising her two children, Christmas Family Bingo, spending time with family, and driving and seeing new places. She loved the outdoors, bird watching and family genealogy. She was well informed in current events, loved to discuss politics and enjoyed a snarky sarcastic comment now and again. Beverly was intelligent, valued education was independent and made countless friends and impacted numerous lives. She was loved by many will be dearly missed. 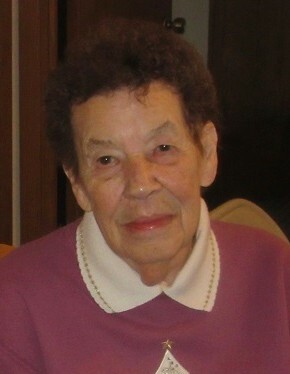 Beverly lived in Twin Lakes, WI from 1958 to 1972. She raised her family in a small house where there was always room for friends and extended family, in the house, and in her heart. For her children she was known for making the greatest and most creative Halloween costumes and having the best Birthday parties in Twin Lakes. She was an active civic leader and served at Twin Lakes Congregational as a Sunday school teacher and Senior Youth group leader. Beverly was a long time Girl Scout leader introducing young girls to the outdoors, camping skills and environmental responsibilities. Beverly was President of the Parent Teacher Association and advocated for school improvement to strengthen the quality of education. She also advocated for progressive inclusion of all students long before this was a popular cause. She served on the Twin Lakes Park Board and was active in both local and national political campaigns for Republican and conservative candidates. Beverly held various positions throughout her life but was most proud of having served as police matron for the Burlington Police Department where she earned a certificate in firearms. She was also a proud member of the American Legion Auxiliary in Burlington. She attended Alverno College later in life, where she drove many of her “damn liberal” professors to drink while sharing her strong opinions on almost everything. She was known by her family, friends, neighbors and anyone willing to challenge her as a fierce and skillful player of Scrabble. Beverly cared for her husband Charlie during his extended disability with dignity and grace. She loved and cared for her daughter Julie’s dogs and treasured her backyard birds. Beverly, wife of Charles Freeman (deceased), is survived by her son Douglas Fischer (Lisa), Hillsboro, OR, her sister Barbara Mollberg, Cudahy, WI, stepson Randy (Kay) Freeman, Brookfield, WI and step daughters Pam and Marcie. She is also survived by her grandchildren: Richard, Dylan, Madeline, Christopher, Kelly and seven great-grandchildren along with many friends and relatives. Beverly was preceded in death by her parents, husband and beloved daughter Julie Riess of Huntley, IL. Memorial Gathering Saturday March 30, 2019 at CUDAHY UNITED METHODIST CHURCH, where Bev so lovingly served and was a member, at 12:00 PM, service to follow at 1:00PM. A reception and lunch will follow. A private graveside burial will take place in spring at the family cemetery in Poy Sippi, WI, where she will be buried alongside her parents. In lieu of flowers, donations in her memory can be made to the Cudahy United Methodist Church, 5865 S Lake Drive, Cudahy, WI 53110.